OXFORD, Miss. – Lori Fain, of Sherman, and Brenda Raper, of Nettleton, are both busy mothers and grandmothers who not only spend time investing in their families but are beginning careers that also will allow them to invest in the lives of others in their community. 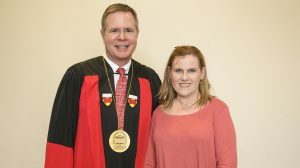 As students at the University of Mississippi at Tupelo, both ladies’ efforts are being honored this spring as recipients of 2018-19 Marcus Elvis Taylor Memorial Medals. Only the top 1 percent of all students enrolled at the university receives this award each year. Recipients must have at least a 3.90 grade-point average to be considered and receive nominations from UM faculty. 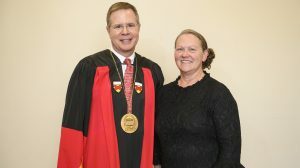 “Brenda is truly one of those students I will never forget,” said Svjetlana Curcic UM associate professor of education. “We tend to assign a label of a ‘nontraditional student’ to those who enroll in college at a later day. 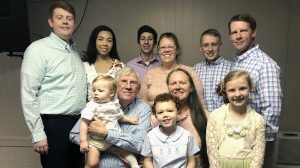 Upon graduating from Itawamba Agricultural High School in 1980, Raper married and started working as a clerk at the Lee County Tax Collector’s office in Tupelo. She and her husband, Danny Samuel Raper, started a family and soon added three children to their home. While raising children, she taught everything from 4-year old pre-K through fifth-grade classes in the private school housed at the Tupelo Children’s Mansion for 11 years. At the end of the 2012 academic year, the school program had to lay off employees, and Raper found herself at a crossroads. So, in 2014 at age 52, she enrolled at Itawamba Community College and started her college career. After excelling at ICC, Raper transferred to start her junior year of classes on the UM-Tupelo campus. During her time there, she stayed involved in student organizations and worked to maintain her 4.0 GPA. This spring she served as a student teacher in a third-grade classroom at Rankin Elementary School in Tupelo. Fain attended East Union High School before getting married and moving to Washington in 1990. A few years later, she returned home to Sherman and earned her GED at ICC in 1993. Her family soon began expanding with the addition of her four children. Throughout this time, she worked as a phlebotomist with United Blood Services and later as an office manager with a local dentist. After a divorce and unexpected job loss, Fain began to experience financial issues. That’s when she decided to work toward earning her bachelor’s degree in social work. Fain said she decided to major in social work because she wanted to help people who might find themselves in the same situations she had struggled with. “People can get lost,” Fain said. “I want to help other people who may be going through some hard times just like I did. During her senior year, Fain helped to organize a “Kids Fest” event at Ballard Park in Tupelo. The event had free games and prizes for children while raising awareness for child abuse prevention. 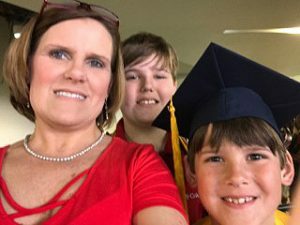 Because of Fain’s life experiences, she demonstrated a unique ability to problem-solve in real-world scenarios, said Jandel Crutchfield, an assistant professor of social work at UM-Tupelo. Fain said she has learned so much about herself throughout her time at Ole Miss.